I thank God for the papa that you are to our children. You are slow to anger, generous with affections, kind with words, ready to be silly and fun with them, willing to listen and so much more. 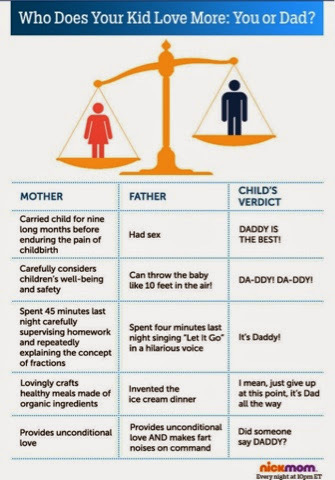 Recently I saw this fun chart from Nickmum about who the child loves more, Mum or Dad. I read it out and you promptly agreed with everything it says. And rightly so, in our household, I'm the disciplinarian and da-ddyy is the fun guy. The one who teaches them how to put the carrot on their top lip, sing silly songs about sweat, doing crazy stuff in the swimming pool while mummy stresses that someone is going to get hurt. So, the kids are always going papa papa papa papapappapa and I can hardly blame them. I remember how you took both kids single-handedly back to France for the holiday for the first time when I could not take off from work. The boy was almost two and the girl was four. You flew for THIRTEEN hours with them, and then had to transit for another FIVE hours! What a trooper! Everyone I speak to is amazed at how you manage to handle both kids by yourself. And since then, you have made a few more trips with them back to France by yourself while giving me a break to take holidays on my own. You are certainly one of the most hands-on dads ever! 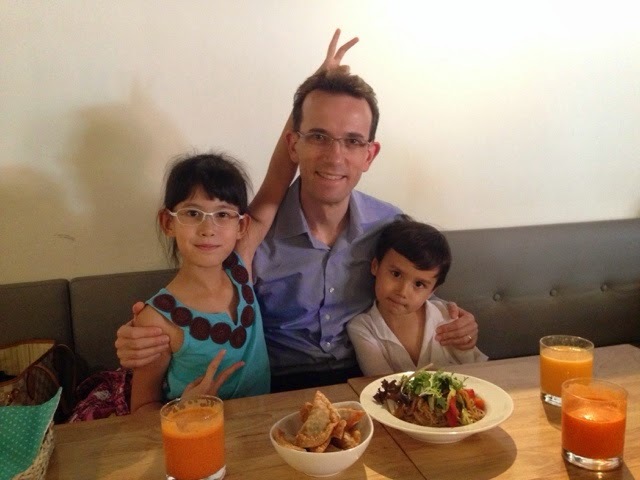 Here's the man of the house with his two munchkins at Real Food Cafe Killiney. 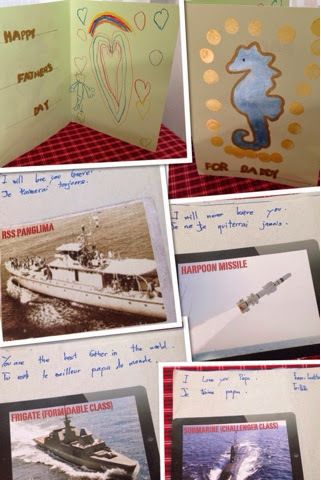 And the kids made papa cards. The boy made a card and a seahorse fridge magnet in school. The girl made a little booklet with some stickers telling her daddy how much she loves him. She even wrote them in both English and French, just in case! Happy Father's Day my love. I hope you had a good day..... and I'm sorry your special gift has not arrived in the mail. SOON OK!